Members of the International Indian Treaty Council ask for indigenous peoples rights to be respected at the UN climate change conference (COP21). 9 December 2015. He also underlined civil society's critical role in driving climate action on the ground: “You have provided examples of new ways of working and innovative new solutions that are creating a greener, more sustainable world. I urge you to continue to demand more from all Governments,” the UN chief stated. 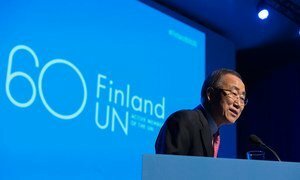 On the occasion of the 60th anniversary of Finland's membership to the United Nations Secretary-General Ban Ki-moon commended the country on its leadership in advancing the Organization's work on peace and security, development and human rights, and expressed his gratitude for the country's solidarity with refugees in the region.